I haven't done a knitting post for a while, although I have been doing a lot of knitting. It just seems that every time I thought of taking a picture of my sweater, it was at a stage where I couldn't take a picture. This is my Carabe sweater. It is so very close to being done. I've enjoyed doing this one, and I've learned a couple of new techniques while doing it, too. A new method of button holes, and a new method for casting off stitches. I liked both new methods. I'm also liking the way this one is fitting. It's a little looser than the last few sweaters I've done, which will make it a bit more versatile. However, I won't be doing any knitting on it over the next couple of days, though. The guild is hosting a sew-in mini retreat. We'll meet at 9 am until 9 pm both Friday and Saturday, and sew until we drop. At which point we can go home to our own beds to sleep. I have plans...... big plans, for what I want to get done. Whether I get there right at 9 am........ not likely. It'll probably be closer to 10. I've made myself a list of what I want to take. Now, all I have to do is round it all up and get it ready to go into the car in the morning. Depending on how I feel when I get home tomorrow night, I might post a progress report. In the meantime, I'm linking up to Judy's On the Needles. The Blooming Nine Patch is finally done to the point where I was able to get it off the wall. Now, I've put up the Rainbow triple Four Patches. I've been playing with the layout this afternoon, and I think I've decided I like this one best. I still have one more red square to make, and the eight orange squares before I can start putting this one together. I'm hoping to at least get the last red one done tonight. I had a bit of a funny happen today. Our guild is doing a Canadian themed Row of the Month quilt, and I'm writing up the instructions. Once I get them written up, I send them off to the other members of the program committee for testing to make sure there are no mistakes in them. This months' row is fairly simple in construction, but it requires some attention payed to the placement of colours and direction of different pieces. All through writing the instructions, I emphasized the care needed in the placement and directions of the fabrics. I even took pictures as I made my own block as an example. Imagine my embarrassment when one of the testers emailed me to let me know that the patches in my example square were going in the wrong direction from the layout picture. Oops...... It's all fixed now, and the revised version is now in their hands, or at least their email inboxes. My task this evening..... rip out the 2 1/2 blocks that I've already done, and get the fabrics going in the right places. And maybe, just maybe, I'll get the last red square done, and the oranges cut to finish this quilt. Before I do that, I'm going to link up to The Needle and Thread Network. I've been sewing this week. I finished up, almost, the red triple four patches that I'm doing for the Scrappy colour challenge, and I also cut out and partially assembled the next row for our Canadiana Row quilt for the guild. That used a little bit of stash. I received in a lot more. There are some blacks and reds and greys and golds that I'm collecting that are, right now at least, planned for a Lady of the Lake quilt that I want to do. The whites with blacks are for the +&x quilt that I started a while back. And the bottom row of fabrics are just because I liked them and thought they would make a pretty quilt for something, but I'm not sure what, just yet. There are a total of 31 fat quarters there, which add up to 7.75 yards. There isn't a lot else happening here today. Just some hanging out on the couch, and playing mindless games on the computer. I've also been playing in Electric Quilt, and I think I have a plan for my Scrappy Triple Four Patch quilt. Wanna see. or is that a silly question? 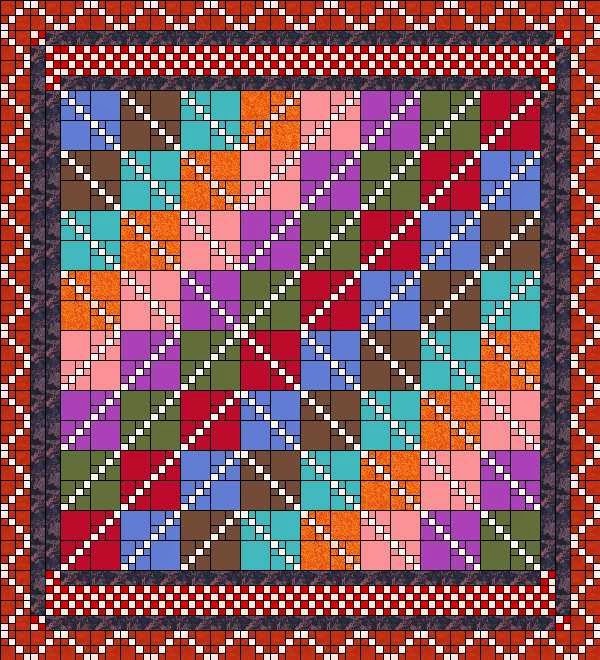 The outer double four patch border will also be scrappy, as will the checker boards at the top and bottom of the quilt. I think it measures something like 80x100. It might end up with an outer plain border, just to stabilize it. That will depend on what I find in the stash, since I really don't want to have to purchase anything for it, since that would kinda defeat the purpose of the scrappy challenge. I'm Hoping to have my Blooming Nine Patch off the wall, and put this one up this week. All that is left to do for this one is 8 orange blocks, and then I can start to assemble this one. I'm linking up to Judy's Stash Report. I've managed to get a whole lot more rows done on my Blooming Nine Patch. All that's left is that top right hand corner. I've run out of the nine patches needed for the outer row, so I have to make nine more before I can go any further. With every section that gets sewn together, I like this quilt more and more. When I first made the fabric selections, especially the black, I really wasn't sure how it was going to work out. At one point, I was thinking that I would either shelve it, or end up giving it away. But not now..... it is going to live right here, and might even jump to the head of the line for my projects that need quilting. I think an over all floral would be perfect for it. I'm linking up to Canada's Needle and Thread Network, and then I think I'm going to call it a day. This is a quilt made by Brenda. She's a new customer to me, and I was quite pleased to do this quilt for her. It was intended as a wedding gift. It was a couple of weeks before the wedding, and she still hadn't gotten it quilted..... I think she may have been planning on doing it herself, although I'm not 100% sure on that part of the story. She suddenly woke up one morning and realized there was no way she would have it done in time. Several of her friends mentioned my name to her. I was able to fit it in, and get it done for her in time for the wedding. Since it was intended as a wedding gift, we decided on a hearts pantograph design, called Wild At Heart. I think it turned out wonderfully, and was very pleased to be able to help her out. This Disappearing Nine Patch is still taking up space on my wall. I have decided that I'm staying up here in the studio, except for supper, until 8 o'clock tonight. I'm going to see how many more rows I can get sewn together by then. It's been selfish and taken up this space for far too long now. Over half of the rows are sewn together, and they all get shorter and shorter from here on in, so I'm hopeful the next couple of evenings will at least see it all into rows, at which point they can be taken down, and something else put up. So, with that goal in mind, I'm linking up to Judy's Design Wall Monday, putting something to watch on netflix, and sewing. I haven't been doing any hand stitching this week, so nothing to report there. And if it weren't for yesterday's workshop from the guild, there wouldn't have been any stash use either. We had a wonderful time, and very educational, learning how to make and insert curved flying geese, taught by Susan Clark, from the Burlington area. I've had a stack of 25 New York Beauty blocks hang in around for a few years now, the result of a couple of challenges I did a few years ago. As soon as I saw this workshop, I knew I wanted to incorporate the NYBs into it. This is what I got accomplished in the workshop. The long term plan is to continue with the curved flying geese, and incorporate all the NYBs into a full sized quilt, having the geese going around and under them. There will be lots more geese going into the grey background areas of this section, and then I'll move onto another being section. Note, I said long term project I'm not sure of the fabric used amount for this, since there is a lot of waste, but I'm going to guesstimate about .5 yards. That net added number is going up, again. Thousands of Bolts had a fat quarter sale on last week. I indulged, just a little bit. I suspect, once those fabrics get here, that my hope of ending up in net stash used numbers this year is pretty bleak. But, I really can't say that bothers me. They will find a home in a project somewhere. I've been working on this POTC block today. All of what is in this picture is all sewn together. This one is half way there. When it's done, I'll have four of them. If I do a quilt made up of 12, that means I'm 1/3rd there. There hasn't been a lot of stash used this week. Just what it took to do the four triple four patches from yesterday. I had planned on doing the other four red ones I need yesterday. But there was a really great series of shows on the history network about the two world wars, so I sat and watched that, and got a lot more knitting done while watching, rather than sewing. I'm linking up to Judy's Stash Report, and Kathy's Sunday Stitching, link found at the beginning of this post. I'm back at working on my Rainbow Scrap Challenge project. However, I'm way behind on making the blocks, and skipped a few colours, as well. Yellow, which was June's colour, wouldn't have worked at all with the background fabric for this project. I could have used golds, but I have another project that I'm saving golds for. July's colour was red, so that's what I'm working on now. I have four more of the larger blocks to make out of reds. I can probably get those done today. My original plan for this quilt was to make it 8 blocks wide, by 10 blocks long, and border it with the double four patch blocks. I'm re-thinking that plan, and instead might make the center of the quilt square, 8x8 blocks wide and long. I have tons of those single four patches in a bag, and I think I'll use those at the top and bottom of the quilt to make it rectangular. If I do that, I only need to make one more set of these blocks, probably using the September colour of orange. So, I'll link up this page to today's Scrappy Saturday, and then go back to making more reds. I'm knitting along with Judy and a few other ladies, making the Carabe Sweater. This is an fairly easy knit, and going quite quickly. I'm two rows away from splitting off the sleeves. I've never done sleeves the way that are done in this sweater. I really like this method. There just might be more of these sweaters in my future. A nice textured coloured yarn, and leave off the stripes would be lovely. I'm linking up to Judy's On the Needles, and then I'm going back to more knitting. Owls, you say....... what owls? Look closely at the fabrics, and you'll see little owls floating around. In addition to owls, there are buttons, and raindrops and bicycles floating around on the fabrics as well. What a fun combination. Those owls, though, were the inspiration for the quilting design, which is also owls. One is wide awake, with eyes wide open, and the other is sound asleep with eyes shut. Sometimes a quilting design seems like it was made for a specific quilt. This was one of those times. The Blooming Nine Patch is next on my list to get finished into a top.The hardest part was figuring out exactly where I was in it. Ended up that I had to take down the squares that weren't sewn together yet, get the book out, and then put the squares all back up again. I had started sewing together the top half of the quilt last night, before I re-arranged everything, and once I had the one row partly sewn together, I couldn't figure out how or where it was supposed to go. Reading the instructions is definitely a good idea! I still have some of the nine patches for the last combination of fabrics left to sew together, as well. It's a little late for doing that tonight, but maybe tomorrow? In the meantime tonight, I'll link up to the Canadian Needle and Thread Network, which has a weekly Work in Progress Wednesday. Then I think I'll work on my sweater. 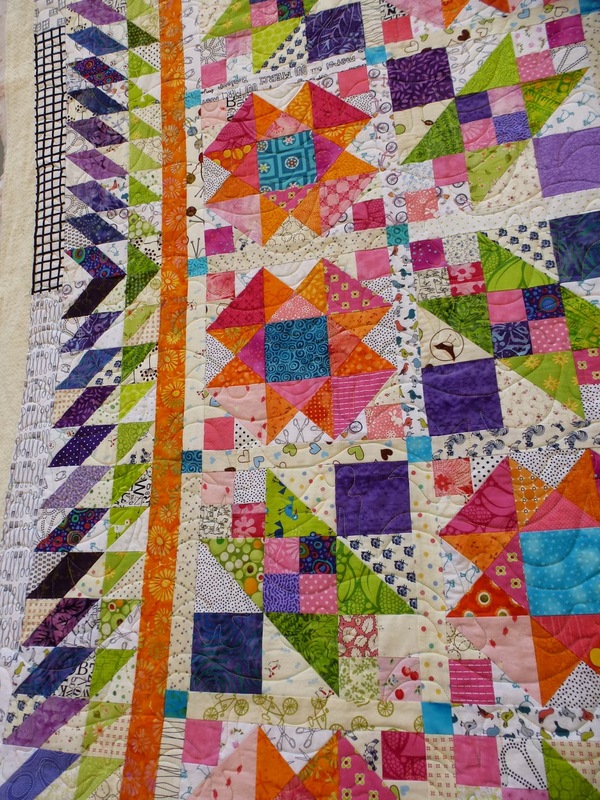 This is Gail's Lazy Sunday Mystery quilt. 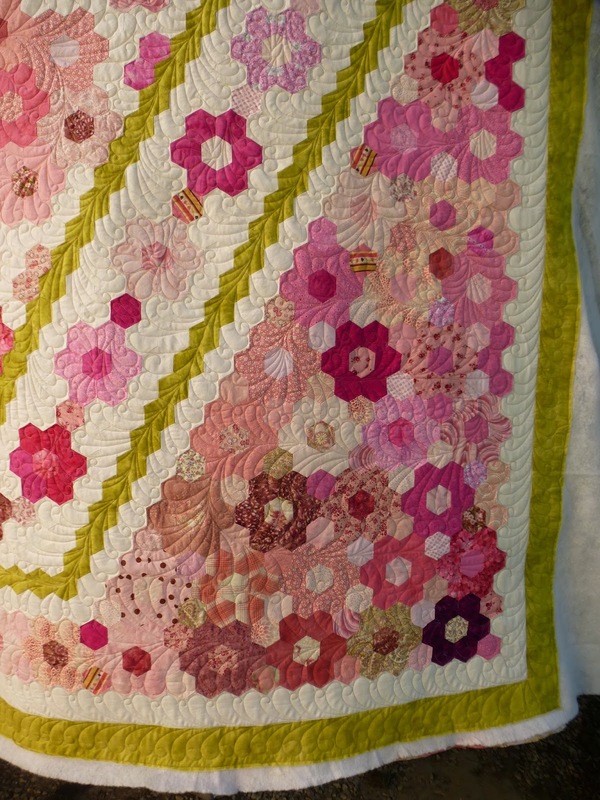 It's a Bonnie Hunter design, that ran in Quiltmaker magazine, over four issues back in 2013. As in all Bonnie patterns, it has hundreds, if not thousands of pieces. 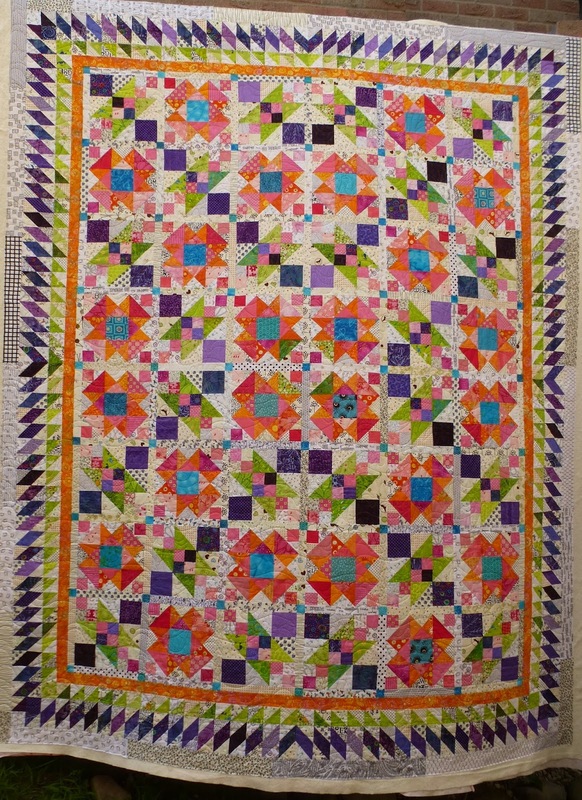 I love the bright, happy colours in this quilt. 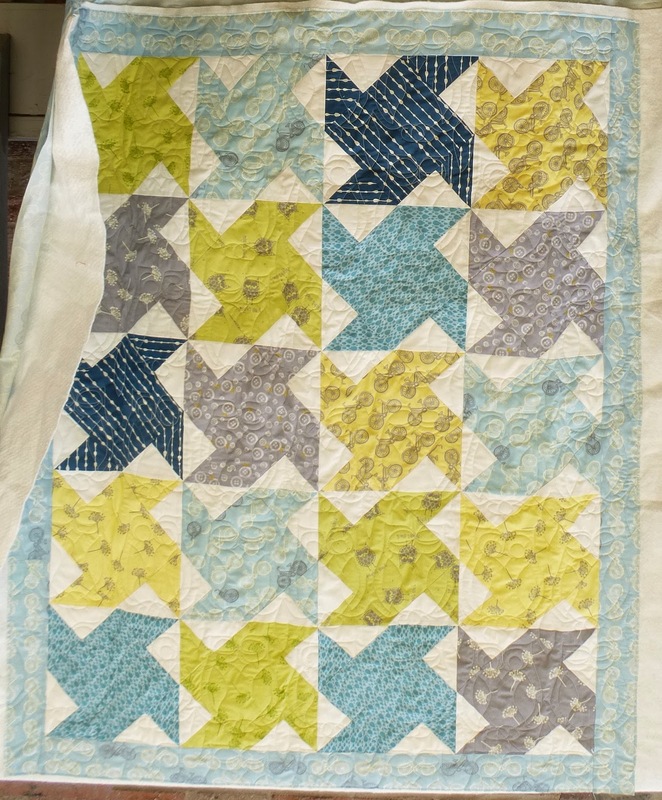 It was quilted using an Angel Pantograph, which added all kinds of lovely soft curves to all the sharp angles of the piecing. This could be a quite fun I Spy quilt, as well. The background fabrics are full of wonderful things to look for. Do a biggie size of these two close up pictures, and see what you can find. I'm still working away at my hand stitching of the Patchwork of the Crosses, and loving every stitch of it.This is the one from last week, all finished now. While talking on Face Time with Gail one day last week, I pulled out the box of fabrics I've set aside for this project, and picked these for the next four. I have one more of the pink ones to sew in, to get the center of it finished. This added to my stash used numbers, which were pretty good this week. It's been a gorgeous afternoon here today, much too nice to just simply sit inside and do stitching, although I have done some of that this morning...... yes, I said this morning. I think I like that extra hour we got last night. I did some stitching this morning, and also had a lovely Skype visit with Avery. I've been watching Judy, over at Patchwork Times talking about a sweater that she is starting. She's issued an invitation to knit along. I've hemmed and hawed about it, thinking I don't really have time to start something new. But, I have this yarn sitting here, that hasn't got a project assigned to it, and I've been looking for one for it, but so far, nothing has jumped out and said I'm it....... until now. It's the grey yarn sitting on top of the pink yarn. And I think that was the problem...... the grey yarn wanted something else to go with it. It didn't want to be grey all by itself. So I went out this afternoon, since it was, as I said earlier, much too gorgeous to stay indoors, and I headed out to a yarn shop nearby to see what I could get to keep the grey yarn company, and came home with this pink.... it's a bit pinkier than what shows in this picture, but not by much. I'm calling it a big girl pink, as opposed to a baby pink. Anyway, the pattern that Judy is using is Carabe, and it's the one that was waving its hands saying "me, me...... do me", and who am I to argue. The grey is the main colour, with the pink being the stripes. So, after I finish writing this, and doing the link ups to Kathy's Sunday Stitching and Judy's Stash report, I'm going to purchase the pattern, get it printed, and then cast on a new sweater....... so exciting!! This has to be one of the most fun quilts I've done in a long time. 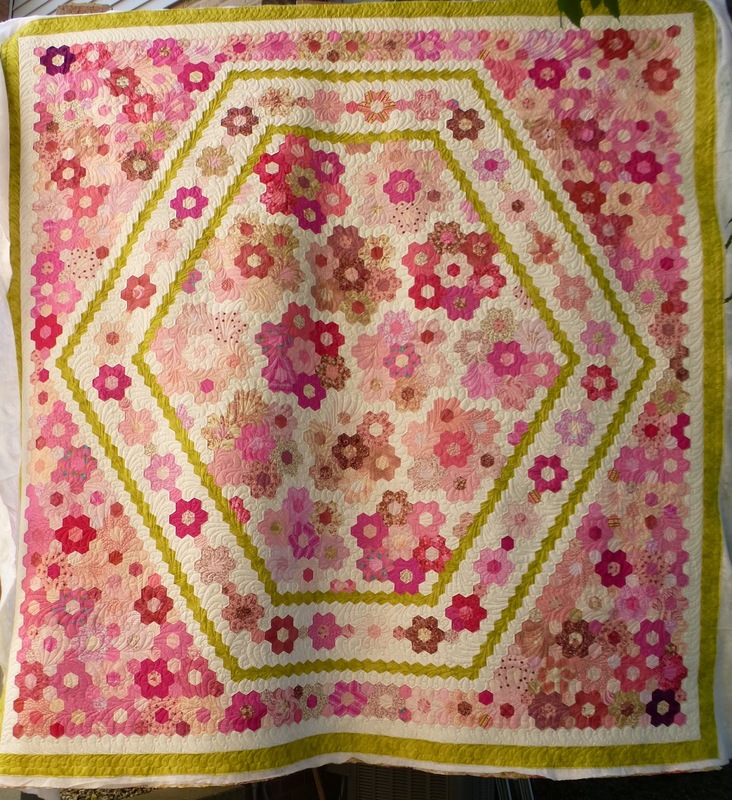 Charlene, who loves her hexies, says that this quilt is the result of making a quilt from a tiny picture, without any idea of what the final size would be. It just kept getting bigger and bigger. It endedup over 100 inches square. It was a bit of a challenge coming up with a quilting design for this. She wanted an overall design, but one that would fit with the feel of a vintage type hexagon quilt. 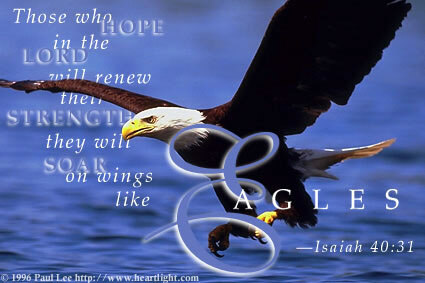 Of course, the first thing that came to my mind was feathers. I do love to do feathers. The quilt has three distinct areas on it, that I decided to emphasise with different feather fills. 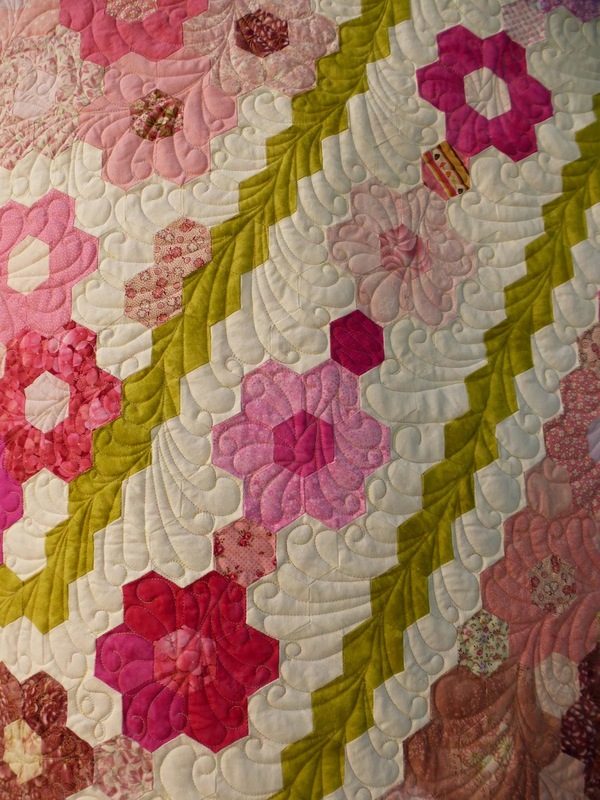 The center of the quilt has a feather meander that goes in a circular motion around each of the large hexagon collections. There's lots and lots of movement there. For the inner border motifs, I used the band of green hexagons as the guide for the placement of the spines for the feathers, which then extended to fill the white background areas. The hexagon flowers in the middle of that border got their own feathers, to form the shape of a flower. The corner sections of the quilt got a simple back and forth feather meander. The outer white and green borders got their own feathers. It was so much fun being able to indulge in so many feathers in one quilt. This one was a joy to do.